So extensively is the history of the coconut interwoven with the history of people traveling that Kenneth Olsen, a plant evolutionary biologist, didn’t expect to find much geographical structure to coconut genetics when he and his colleagues set out to examine the DNA of more than 1300 coconuts from all over the world. The discoveries of the team, which included Bee Gunn, now of the Australian National University in Australia, and Luc Baudouin of the Centre International de Recherches en Agronomie pour le Développement (CIRAD) in Montpellier, France, as well as Olsen, associate professor of biology at Washington University in St. Louis, are described in the June 23 online issue of the journal PLoS One. Coconuts have also been traditionally classified into tall and dwarf varieties based on the tree “habit,” or shape. Most coconuts are talls, but there are also dwarfs that are only several feet tall when they begin reproducing. The dwarfs account for only 5 percent of coconuts. Dwarfs tend to be used for “eating fresh,” and the tall forms for coconut oil and for fiber. DNA was a different story. The project got started when Gunn, who had long been interested in palm evolution, and who was then at the Missouri Botanical Garden, contacted Olsen, who had the laboratory facilities needed to study palm DNA. Together they won a National Geographic Society grant that allowed Gunn to collect coconut DNA in regions of the western Indian Ocean for which there were no data. The snippets of leaf tissue from the center of the coconut tree’s crown she sent home in zip-lock bags to be analyzed. “We had reason to suspect that coconuts from these regions —especially Madagascar and the Comoros Islands — might show evidence of ancient ‘gene flow’ events brought about by ancient Austronesians setting up migration routes and trade routes across the southern Indian Ocean,” Olsen says. Olsen’s lab genotyped 10 microsatellite regions in each palm sample. Microsatellites are regions of stuttering DNA where the same few nucleotide units are repeated many times. Mutations pop up and persist pretty easily in these regions because they usually don’t affect traits that are important to survival and so aren’t selected against, says Olsen. “So we can use these genetic markers to ‘fingerprint’ the coconut,” he says. The new collections were combined with a vast dataset that had been established by CIRAD, a French agricultural research center, using the same genetic markers. “These data were being used for things like breeding, but no one had gone through and systematically examined the genetic variation in the context of the history of the plant,” Olsen says. The definitive domestication traits —the dwarf habit, self-pollination and niu vai fruits — arose only in the Pacific, however, and then only in a small subset of Pacific coconuts, which is why Olsen speaks of origins of cultivation rather than of domestication. Did it float or was it carried? One exception to the general Pacific/Indian Ocean split is the western Indian Ocean, specifically Madagascar and the Comoros Islands, where Gunn had collected. The coconuts there are a genetic mixture of the Indian Ocean type and the Pacific type. 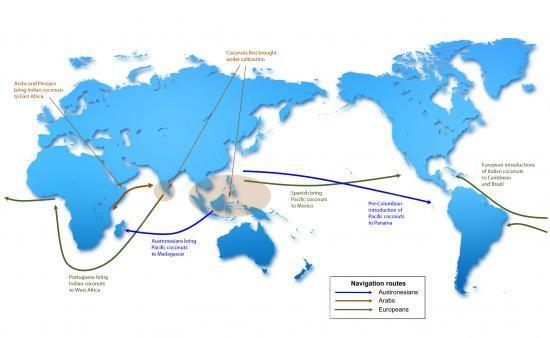 The scientists were astonished by the amount of structure in the coconut DNA, enough structure to allow them to trace some of the coconuts travels with humans. So the coconuts that you find today in Florida are largely the Indian ocean type, Olsen says, which is why they tend to have the niu kafa form.